Puerto Santa Cruz, a small town in the province of Santa Cruz of some 3800 inhabitants is the closest settlement (17 Km) to Punta Quilla. It has a modest commercial activity and there is no industrial activity except that related to fishing. Punta Quilla is approximately 42 km away from the highway which runs along Patagonia in a north/south direction linking the main towns. The closest commercial airport is in Río Gallegos (approx. 250 km away) with domestic flights. Fishing activities presently involve squid fishing vessels, both of Argentine and foreign registry, mostly from February to August, as well as the reception of supply boats attending off shore oil rigs in the area. Fishing vessels usually transship their catch to ocean going vessels at the inner anchorage, otherwise they discharge to the cold store ashore, and this catch is later exported on reefer vessels loading alongside. Fishing vessels also use Punta Quilla for general supplies and repairs. 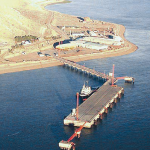 Punta Quilla is a well made reinforced concrete pier orientated in a NW/SE direction, of 158 m length and 30 m wide, with two outlying mooring dolphins located 60 m from each end of the pier. Depth alongside 10,60 m (34 ft) at datum. The pier is connected at an angle to shore by an access causeway 250 m long and 9 m wide. Berth Nº 1 and Nº 2 allow vessels to berth on both sides of the pier but the inner berth (Nº 2) is normally only used by small craft such as supply boats. CAUTION: Due to the strong current of up to about 6 knots and a tidal rise and fall of 11/13 m (36/42 ft) a careful watch on deck should be maintained at all times. Port Administration grants berths as per order of arrival. However, sometimes priority is given to naval transport command vessels depending on the type of cargo they are carrying. No maximum LOA stipulated. However advisable consult for vessels over 180 m. Largest vessel to berth to date was of LOA 220 m which loaded an experimental shipment of 36.000 ton of coal ex Río Turbio from coastal craft. 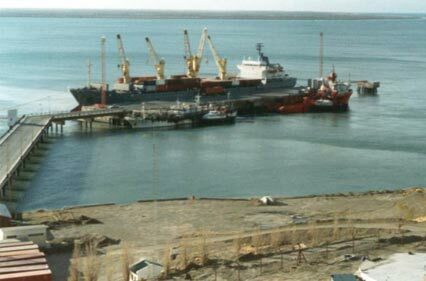 Compulsory for foreign vessels; pilots are not stationed at Santa Cruz and must be requested privately to Puerto Madryn or Ushuaia, recommended 48 hours in advance. Pilots embark-disembark by launch at outer anchorage. Pilots recommend anchoring 4,5 miles south of Santa Cruz beacon in depth of around 40 ft at Latitude 50º 14´ South Longitude 068º 22´ West. Due to the strong current and danger of high winds it is advisable to anchor with as much chain out as possible. The least depth in south access channel is 1,22 m (4 ft) at datum and at Punta Quilla anchorage and alongside berth 10,60 m (34 ft) at datum. 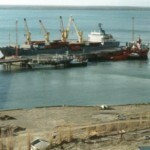 Vessels should enter on the rising tide using the south channel, berthing port side to quay when the tide starts to turn. Sailing is normally arranged for half an hour before high water. The current runs practically parallel to the pier. Santa Cruz Prefectura Naval Radio (Coastguard), call-sign L4L. R/T on 2, 4, Mhz and VHF channel 16. Punta Quilla Prefectura Naval Radio (Coastguard), call-sign L4K on VHF channel 12. December 1st (Anniversary of city´s foundation). There is a fully equipped regional hospital available. Serious cases are sent to Río Gallegos by ambulance to be treated there or to be sent to Buenos Aires. There are three small residential hostels. 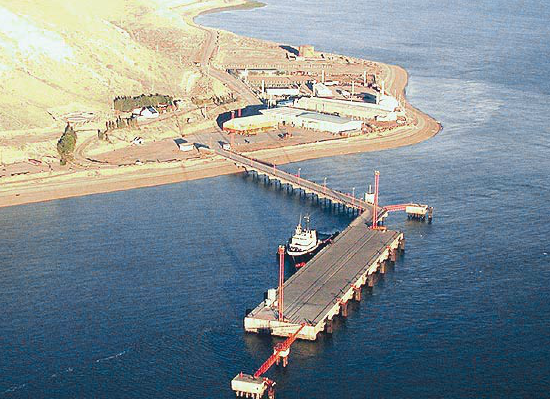 Transportation: Daily bus service from Santa Cruz north to Bahía Blanca and Buenos Aires and South to Río Gallegos/ Punta Arenas. There is, at present, one flight a week from/to local airport in the same directions, however Río Gallegos is less than three hours by road with daily flights to Buenos Aires and other coastal cities. There is a gas oil tank at Punta Quilla adjacent to the berth with a storage capacity of 3000 cbm permitting vessels to bunker via pipeline. Fuel oil can also be delivered by truck if requested not less than three working days in advance. However, allowance must be made for slow intake/delivery, 100 Tons/Hour. Fish/gencargo 80/100 MT/shift per gang. Berths fitted with fixed rubber fenders. Supplied via pipeline from a 700 cbm deposit at rate of about 35 cbm/h. Garbage in drums can be transferred to trucks. Port Authorities have two refuse skips available. Seasonal winter zone (Apr 16th -October 15th). See ILLC. A local workshop can attend minor deck/engine repairs. 3 UNEPOSC mobile cranes of 50 ton SWL available plus 2 forklift trucks, SWL 2×2,5 , 1×4 and 1×7 ton as well as 1 x 80 ton hire by private contractor. The ship chandler is also owner of the local supermarket and usual kitchen stores available provided sufficient advance notice given. 1) UNEPOSC Port Administration. Bonded warehouse 4800 cbm. Open storage area 4200 sqm. 2) BAHIA GRANDE. Cold storage with capacity for 2000 ton frozen fish. Open storage area 3500 sqm. 3) UNEPOSC Customs controlled open storage area 4500 sqm. 4) UNEPOSC Customs controlled warehouse 1250 sqm covered area. 5) TOTAL 2 x 450 sqm warehouses on lot of 9626 sqm. 6) TOTAL 2 x 360 sqm warehouse on lot of 10.057 sqm. 7) TRANSMARINE Muelles y Dep—sitos. 780 sqm warehouse on lot of 9726 sqm.